Love Yourself First! Friday is baaaack. I am so excited about it, too. Do you know over 50 women have been featured for this self-love series? That’s something to celebrate. When I created it in 2012 I had no idea what would happen or if women would even say yes to being interviewed for something that most certainly requires a great deal of vulnerability. Well, they’ve most certainly responded with a resounding YES, and six years later LYFF is still going strong sharing profound stories from some of the most phenomenal women who unapologetically love themselves and are dedicated to wholeness, happiness, healing and self-care. About this LYFF Feature: Tiarra is a busy mama and wife who works in communications. She is a writer and contributor for Columbus Moms Blog and The Mom Edit. This Phoenix is a happy spirit who shares her perspective on life, love and family with authenticity, honesty, openness and lots of humor. It’s truly admirable…along with the fact that she does it all with such great style. This year I made a commitment to dedicate time to self care. It’s not in the idea that you might expect though. I love a mani/pedi as much as the next gal, but it’s more than that. I’ve been focused more on getting out of my comfort zone. Whether it’s signing up for personal/professional groups or training, I’m finally making the time for it. I’m an introvert, so I have very little desire to network. Ever. And certainly not after I’ve already put in a full day at work. It seriously scares the heck out of me! But I’m starting to realize that executing on my self-growth goals is just as important and fulfilling as say, a massage, but maybe just in a different way. It’s like a mental weight has been lifted; it frees my mind for other things I really need to think about, not to mention the sense of accomplishment I feel afterward. Even better, I tend to drag someone along with me which has resulted in creating new bonds I wouldn’t have if I didn’t step out of my comfort zone. Writing and exercise have been huge for me lately. There’s always so much swirling around in my head. It’s harder for me to push the thoughts away than it is for me to write. I write professionally, but there’s something about coming home and expressing what I want in my own voice. It’s so powerful. Exercise is the same idea. I could sit around wasting valuable energy procrastinating about working out or I could just do it. I also give myself grace about exercising. I used to have an all-or-nothing attitude: I had to do an insanely intense workout or nothing at all. Well, I’d rarely prioritize the killer workout, so I literally spent years not developing good fitness habits. Now, even if it’s a few pushups or my trusty 7-Minute Workout app, it all counts and makes me feel great. I use apps to track my progress (active hours, steps, weight loss, etc.) and it really helps me stay motivated. When I get off track, I know now that it’s not a deal breaker and that I’m really only one good decision away from getting back on track. Is there an obstacle or challenge you’ve overcome that led to a deeper love for who you are? It’s mostly just getting out of my own head which is still a daily challenge. My daughter is six, and we have lots of conversations about confidence, celebrating victories, and playing for self-improvement and fun, not just competition. Then, it hit me one day how much I needed the same pep talk. I’ve talked myself out of more opportunities and beat myself up about the most random things. And why? What’s the harm in putting myself out there? I had to get to a point where that question was no longer rhetorical. There’s nothing bad that can come of attending a networking event with girlfriends or like-minded people. Lately I’ve been saying that I’m “jumping big waves” like my kids at the beach. I can’t think of a better way to describe my journey of self-love. They get really excited to go in the ocean, but as soon as they see the waves, they change their minds. Then, my husband or I will go with them; they squeeze our hands while we help them jump (or jump with them). Right on the other side of those big waves are joy, accomplishment, pride and so much more. I’ve jumped a few big waves in the last few months and experienced the full spectrum of emotions that comes with it, but I absolutely plan to keep jumping. To keep being inspired by Tiarra’s self-love journey, check her out on Instagram. 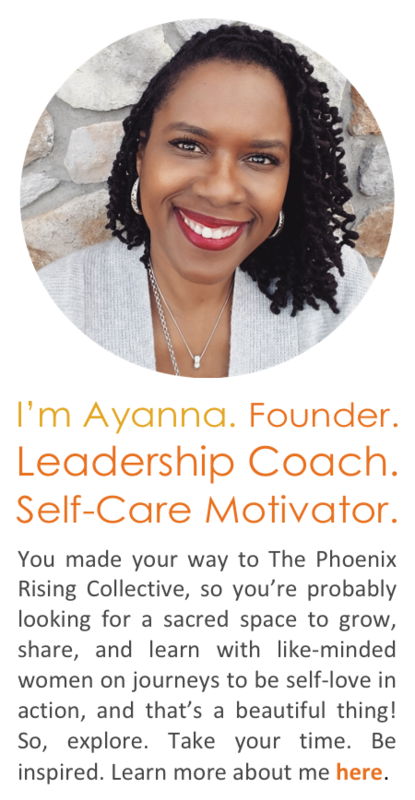 Ayanna Jordan is founder of The Phoenix Rising Collective and creator of Love Yourself First! Friday. As principal consultant and leadership development trainer and coach, she develops and facilitates dynamic women-centered workshops and programs with a focus on how putting self-love into action can transform your life. She also creates coaching seminars and training that support women’s professional growth in authentic leadership, entrepreneurship, and passion-filled work. Her interactive approach inspires action and creates a non-judgmental, sacred space for women to truly explore their personal and professional goals while gaining support and sisterhood from others who’ve also made a commitment to sustaining self-love. Join the LYFF tribe! Share your self-love story. Send an email. Just put “My LYFF Story” in the subject line, and you’ll be contacted by the Phoenix Team with details on how to participate. Check out the Collective on Instagram and Facebook. Categories: Love Yourself First! 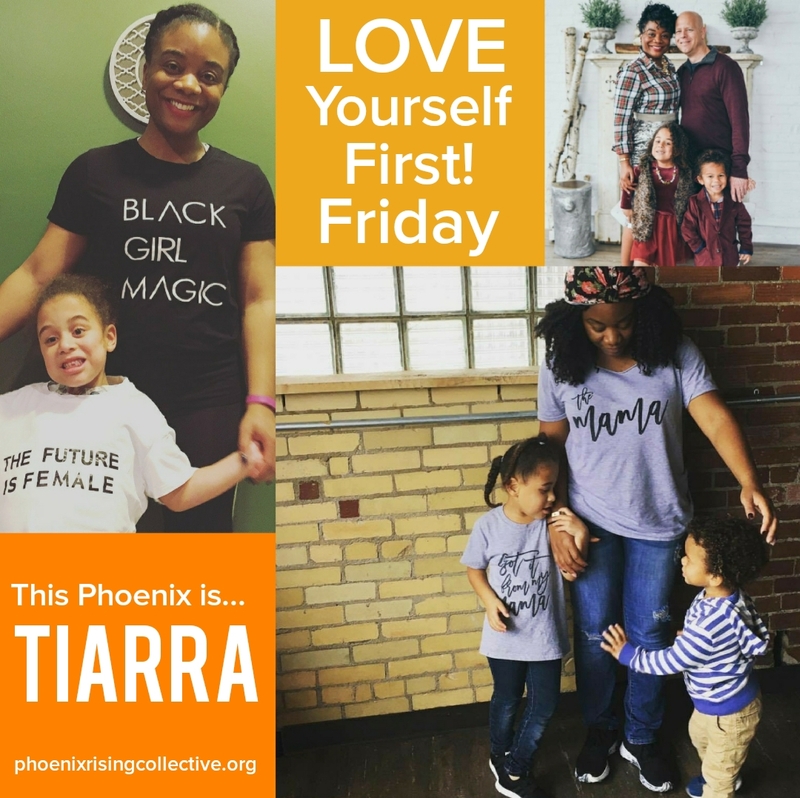 Friday | Tags: healthy well-being, Love Yourself First Friday, self care for moms, self-care, self-care tips, self-love, the phoenix rising collective, women's empowerment, women's wellness | Permalink. This is the last I Thrive #selfcaresunday Meetup of the year! So, join me for Setting-Your-Intention Meditation & Self-Care Book Swap. And, at the end of the afternoon we’ll share a toast to the new year. Special guest, yoga teacher, Ellen Smith from Love Yoga Flow and Yoga on High will guide you through a meditation to support your intention and affirm your vision for 2018. Don’t worry if you’re a beginner! All levels are welcome. Come with an open heart to release the old and embrace the new. I’ll also be sharing tools you can use from The Fullness of Me Intentional Living Guide; it provides clarity on your goals so that your actions can be in alignment with what you say you want. Your self-care/personal growth book for swapping! Dress is casual. Please wear workout/comfortable clothes. I can’t wait to see you at this one – for sisterhood, to hold space for one another as we let go of what no longer serves us, and to make room for new experiences and clearer, healthier perspectives. I don’t know about you, but 2017 has been a pretty challenging year. I’ve learned some invaluable and significant lessons. Lessons that have definitely taken my personal growth to the next level…and for the better I might add. One of the biggest is to always trust myself. So, I am ready to clear a path for 2018 because this wisdom has made me even more resilient. Watch out! What lessons have you learned this year that have provided more clarity? I’d love to know. Share in the comments. And, of course, register HERE for Setting-Your-Intention Meditation & Self-Care Book Swap. I’ll see you Sunday, December 10. Continue being self-love in action. Ayanna Jordan is founder of The Phoenix Rising Collective. As principal consultant and leadership development trainer and coach, she develops and facilitates dynamic women-centered workshops with a focus on how putting self-love into action can transform your life. She also creates coaching seminars and training that support women’s professional growth in authentic leadership, entrepreneurship, and passion-filled work. Her interactive approach inspires action and creates a non-judgmental, sacred space for women to truly explore their personal and professional goals while gaining support and sisterhood from others who’ve also made a commitment to sustaining self-love. Categories: Self-Care + Personal Growth | Tags: healthy well-being, I Thrive, intention, meditation, new year, personal growth, self-care, self-love, women's empowerment, women's self care | Permalink. How do you love yourself first? I love myself first by understanding that I must take care of my mental, spiritual, and physical health to sustain in a world that attempts to drain me. I have learned over the years that I teach others how I value me. I know if I don’t take intentional time for me, then others will not respect me or my time. I APPRECIATE my journey. I cannot look at someone else’s blessings and long for what they have. I PRACTICE what I preach. As a solo parent of three (19, 14, 12), it is imperative that I show love for myself. If I am not demonstrating to them how to love, how to cherish, and how to use their voice, they will not learn. What actions demonstrate the self -care you provide to your mind, body, and soul? Ahhhhhhh, I love this question! I am an educator, a poet, and an avid reader. I have an endless supply of Post-it Notes I keep handy because my mind is ALWAYS spinning, thinking of new ideas or new quotes. I LOVE QUOTES, especially motivational ones. I have “stickies” everywhere reminding me of special prayer requests, thoughts, and reminders of who I am! My favorite is “I AM LIGHT.” This is penned from a song by India Arie that reminds me that I am light, and who I am is reflected in all that I do. I am who I say I am. No one can define me or label me. Is there an obstacle or challenge you have overcome that led to a deeper love for who you are? I didn’t realize until the past year that I suffer from depression and anxiety. I am a person who will work and work and not ask for help (because I believed no one wanted to). I would hold in emotions until I was ill. I have in the past year gone through probably one of the darkest years of my life. Years of holding emotions and thoughts in and not being who I needed to be for me, finally manifested into a complete breakdown. My health suffered. I gained 30-40 pounds. My professional life suffered. And worst of all, I didn’t think I was worthy of being blessed with life. I have learned through positive affirmations of family and friends, through taking time to be still (waiting for God’s voice), and through being intentional with my life and goals that I am light and love. My steps are divinely ordered. I just needed to step into the shoes I was born to walk in. What have you learned from self -love? “Love…so many things I’ve got to tell you but I’m afraid I don’t know how…” I LOVE this song from Musiq Soulchild. I listen to it a lot because the lyrics tell of unconditional love, the kind of love that we need to have for ourselves. I have learned that self-love is needed to sustain, and sometimes I have to take time out to love on myself and to love on others. I have learned that I am called to be a “servant lover” of others in order to be content. I immerse myself in my non-profit Young PEARLS (a mentoring group for young women ages 14-17). I continue to perfect my writing and speaking skills with my company TraSpeaks, LLC, and I pour into the students I work with on a daily basis. I enjoy building up my community and partnering with others who love to do the same. I have learned that self-love is self-confidence. I have always been bold, fearless, and opinionated. These attributes are what make me, ME, and I love it. Love Yourself First! Friday. Phenomenal women who fiercely and unapologetically demonstrate self-love in action share their stories – powerful, honest, heartfelt stories that shed light on diverse ways to make self care, healing and whole living daily priorities. Join the tribe! Share your story. Send an email HERE. Just put “My LYFF Story” in the subject line of your email, and you’ll be contacted by the Phoenix Team with details on how to participate. Join the Collective on Facebook and Instagram. Categories: Love Yourself First! Friday | Tags: healthy well-being, Love Yourself First! Friday, personal growth, self worth, self-acceptance, self-care, self-confidence, self-love, the phoenix rising collective, women's empowerment, women's wellness | Permalink. I love myself first by checking in to see what I need to do in order to feel like me. I believe that life’s challenges and stresses can sometimes distract us from what we really enjoy about life and from what’s important to us. Loving myself first means taking care of myself. Self-care in its many forms helps me get back to that true state where who I am and what I want are clear to me. Sometimes self-care is just maintenance and other days it’s recovery from life’s obstacles and distractions. I find that yoga can really help me check in and monitor why I’m feeling the way I am and what I can do to remedy it. Sometimes talking with a loved one can really help ease my mind and work things out in my head. It can also mean going on a hike or a run with my dog, reading a book, or watching reruns of a favorite show. Other times I feel the need to be more productive and creative, and that to me is self-care, too. Cooking, doing chores around the house, or even taking care of some work that has been on the back burner can feel like self-care. I think sometimes it’s the things I don’t do that can contribute to a distracting feeling of stress and lead to not being able to really connect with myself. It has also been extremely beneficial to me to figure out what I need physically on a daily basis to feel good. A good workout of some kind, vegetables, and at least seven hours of sleep are essential for me. There have been several challenges that have eventually led me to value qualities in myself that I either hadn’t recognized before or had seen as flaws. One challenge was quitting smoking for good. It was a habit I tried to kick several times and finally something inside me just changed. I tend to retreat when I’m dealing with an internal struggle, and I do not like to ask for help. So, when I decided to quit that’s exactly what I did, and I’m so glad. I used to see my self-isolation as a negative trait, but through that situation I learned that it’s how I heal myself sometimes, and that’s okay. I love that I have that strength within me. Another challenge was moving to a new city and new job, then realizing too late I made a bad decision. In our society, we really put a lot of value on persistence and not giving up on a challenge. This is especially true for women when it comes to relationships and for everyone when it comes to careers. I would characterize myself as a resilient and persistent person but only to a point. It’s something I saw as weakness for a long time, but I love that I recognized I wasn’t getting out of a situation what I was putting into it and did something to change it. It’s a quality I have tried to cultivate because I see it as a strength. I have learned from self-love that it is something we must consistently work on. Practicing self-love I’ve realized there are forces in our world that profit immensely from our lack of self-esteem, so they work hard to keep us disliking ourselves. I’m sure we can all think of an individual or two who has benefited from someone else’s lack of self-love. Loving myself and loving things about myself that are easier to dislike right off the bat are a worthwhile endeavor. With self-love I can be free to live in a way that feels right to me, in a way that allows me to listen to and honor my own needs. Categories: Love Yourself First! Friday | Tags: conscious living, personal growth, self-acceptance, self-care, self-care tips, self-love, women's empowerment, women's wellness | Permalink. Loving myself first means living a values-based life. When my Dad, Vietnam veteran and hardworking Appalachian man, was first diagnosed with lung cancer I had just started my PhD program in clinical psychology. I had also just lost my Godmother (my Dad’s sister) to lung cancer. I’ve been working toward the goal of becoming a clinical child psychologist since I have been 13 years old. I have had to overcome my fair share of adversity: a late-diagnosed hearing disability, growing up in Appalachia, and being a first-generation college student. This translates into me being a hard-working poor test taker with a purpose to help others from underserved communities. As I traversed the world of grad school my Dad fought for his life. He was cancer free when I matched for internship 13 hours away from my family. It was the final step before earning my doctorate. Unfortunately, his remission was short-lived. I completed my internship clinical work, working with the population I believe I have been called to work with – providing evidence-based trauma treatments to children and adolescents. As my internship was winding down, I needed to decide where to go for postdoc (the next step needed to get licensed and to solidify my research career). I was at a fork. Do I continue to weave myself tightly within the field of childhood trauma? Or do I move as close to home as possible to be near my family? It is with courage that I chose my family – landing in the stars with my post doctoral career. I value my career, and I value my family and friends just a bit more. Clinical work is emotionally and spiritually draining, but the reward reaped when I am able to help a child, eases the toll to my well-being. Sadly, my Dad passed away just weeks after moving home. Knowing that I needed these two years to breathe and rest my tired heart, I happily engage my research postdoc. This is why I cannot in good, self-loving conscience be a full-time clinician. Instead, I choose to overcome the funding obstacles of research in a climate that is ever so hostile to science. I will do it with courage and a firm understanding that I am Appalachian, and no one can quiet my voice. What actions demonstrate the self-care you provide to your mind, body, and soul? On nutrition: About 8 years ago I stopped eating fast food. I drink almost no soda and try to eat small portion sizes. About 3 years ago, I stopped eating all meats except fish. In the past six months, I started to eat minimal dairy and bread and mostly stick with vegetables, fruits, nuts, and beans. On exercise: In grad school I started running – an identity I have never really embraced despite completing two half-marathons and several 5Ks and 10Ks. More recently, I have been practicing yoga three to four days a week. On balance: I try to minimize how much work I am doing at home. I do not check my work e-mail on the weekends. When I am eating dinner, I do not have my cellphone out. I go see my Mom every Sunday when I’m in town. I spend time with friends at least weekly and have coffee in bed with my husband and our two cats on weekends. On adventure: I travel to see friends, family, and for conferences. When I travel I like to get off the beaten path, go hiking, and learn about the local culture. I also craft, plan and throw elaborately themed parties. Most days I suffer from imposter syndrome. There’s been a challenge at every step of the way in my career path. First I had to catch up with my peers in elementary school to get out of the “slow learners” track and into college prep. Then I had to figure out what being Appalachian and first generation in college meant for me. I then had to score well on the Graduate Record Exam (GRE) and have enough research experience to demonstrate my commitment to scholarly activity for my PhD program. There’s always been a “next up.” I’ve encountered plenty of people – mentors, elders, peers – who have led me to question myself, my worth and ability. Thankfully, for every one of those folks, I’ve had two others to remind me that I am enough and can do anything I put my mind to. I want to make the world a better place. It’s always been about “How can I help?” How can I transform the lives of underserved youth by planting seeds of courage, compassion, and inner strength? I am my strongest when I am helping others. It is what drives me to keep going. So, when my Dad was dying, and I spent all those years away from home doing the “next step” I realized that I had neglected my value for spending time with and helping family and friends. The obstacle of believing that I am enough and can fulfill my life’s purpose without choosing just that over other values has been like taming a wild bear, except I’m the bear and the trainer at the same time. I am learning to have courage. I haven’t always been able to help others; sometimes my path seems like I’ve all but given up on doing that. And while my inner strength does not always shine, I know that I can take breaks to let my mind, body, and spirit heal. Most importantly, my light glows even when it’s an ember. Father/Daughter Dance – My Dad and I dancing to I Loved Her First. I believe he loved me enough to wait until I was home before passing away so that we could all be together. My Life Partner – This guy and I are on this journey together. We’ll dance, walk, skip, crawl, and even carry each other on our path. PhD Graduation Cap – Robert Frost has been narrating my life. I tend to take the road less traveled when I come to a fork. And, oh, has it made all the difference! I still got to where I was going, and I’ll get to where I am meant to be. Vinyasart – I chose this because it captures my creative outlet – exercise and mindfulness – which all nourish my soul. Inspired by Michelle’s courageously honest and heartfelt story? Share your thoughts in the comments. We’d love to hear from you. Love Yourself First! Friday shares the unique stories of diverse women to inspire and empower others to also fiercely demonstrate self-love in action. The questions are meant to shed light on various ways our featured Phoenixes are making self-care and intentional living a priority. Do you want to share your self-love story? Send an email HERE. Just put “My LYFF Story” in the subject line of your email, and you’ll be contacted by the Phoenix Team with details on how to participate. Be sure to read some of our other inspiring stories. Categories: Love Yourself First! Friday | Tags: Appalachia, conscious living, healthy well-being, imposter syndrome, Love Yourself First, personal growth, self worth, self-acceptance, self-care, self-care tips, self-love, the phoenix rising collective, women's empowerment, women's wellness | Permalink. It was difficult for me to really love myself. I tried convincing myself that I did, but inside I always felt very insecure and not always comfortable in my skin. Now that I love everything about me, I never want to lose that feeling. I tell myself something I love about me at least once a day. Every day is not perfect. I still have rough days, but knowing what it’s like to truly love myself (imperfections and all) is a spiritual and healing experience. I make an effort to connect with others, because in the past I struggled to do it. I missed out on many experiences because I was uncertain about myself, and as a result, I lived mostly inside my head. People thought I was mean or stand-offish but in reality I was uncomfortable with ME. Loving myself first means that I take care of my mind, my body, my soul, my heart, and my family and friends. I want to radiate positivity everywhere I go so that if there is anyone out there feeling the way I once did, she/he can find hope and inspiration in my story and in our interaction. I changed many of my negative habits. I make it a priority to remain active weekly – working out frequently and using FitBit to track my steps because it keeps me motivated (I love work-week challenges with my coworkers). I’ve cut out a lot of foods that weighed me down internally (fried foods, bread and dairy), and I replaced them with healthier alternatives (baked foods, non-processed foods, coconut milk). I love to read books of all genres to keep my mind fresh and alert. Lastly, but most importantly, I talk to God through prayer and daily affirmations. I used to be overweight and suffered some complications with my health. Becoming healthier has truly transformed me. I feel good inside and out, and I think healthy eating and activeness have contributed. I am more open to people and have been able to build stronger relationships. Self-love has to be defined by the individual and takes on many different forms. You can show yourself love in your daily actions and interactions with others. For example, I know if I stop practicing my healthy habits I may need to re-evaluate self-love; there may be something deeper going on with me, because being healthy is how I show myself love. I’ve learned that it is difficult to build relationships with others when there is no self-love. I want to make sure I am always loving me so that I can fully love others. I have also learned that people really love me! When I struggled with self-love, I felt that others did not truly love me. I mean, why would they if I could not love myself? What I have come to find is that (1) people really do want to get to know me, and (2) I do have something to offer the world. I have been able to experience things I NEVER would have experienced, and I finally feel like I am living life. It feels good. Inspired by Yewande’s self-love story? Share in the comments. We want to hear from you. Love Yourself First! Friday share the unique stories of diverse women to inspire and empower others to also fiercely demonstrate self-love in action. The questions are meant to shed light on various ways our featured Phoenixes are making self-care and intentional living a priority. Categories: Love Yourself First! 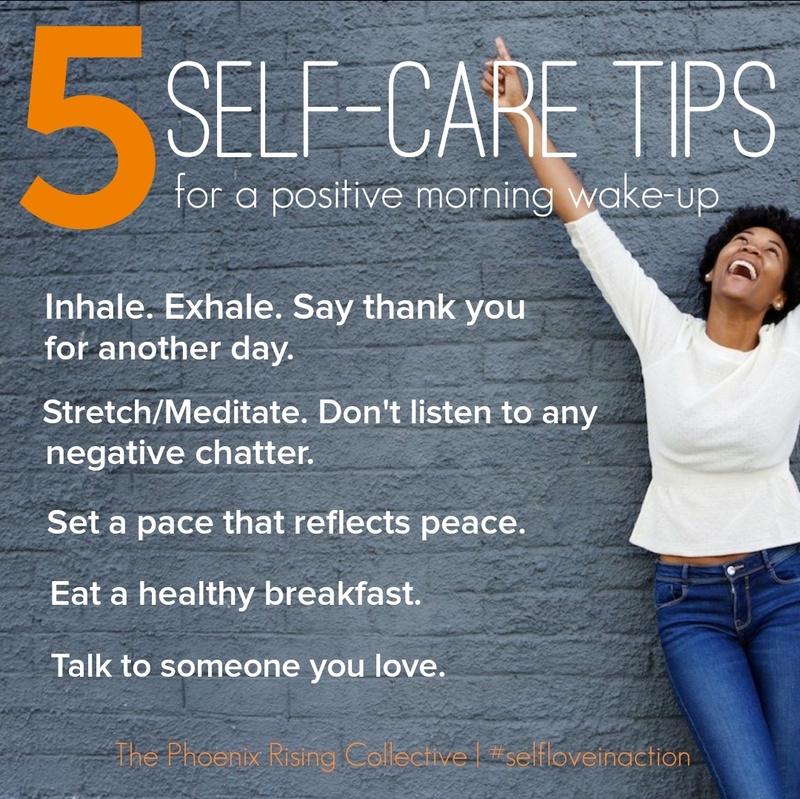 Friday | Tags: healthy well-being, love yourself, self worth, self-care, self-love, the phoenix rising collective, women's empowerment, women's wellness | Permalink. Love Yourself First! Friday is back with all new Phoenix features. This week we’re sharing Tracie’s self-love story. This is, admittedly, a difficult question for me to answer, as I don’t always do a good job with self-love, let alone loving myself FIRST. That said, I’ve come to understand it as centering myself and my needs as first and foremost in the planning and execution of my life. Meal planning is something I’ve recently began practicing as a self-love/self-care habit, which may seem light work to some, but is HUGE for me. Making sure to drink adequate amounts of fresh water daily, allowing space for heightened “inappropriate” emotional moments (esp. sadness & anger) to flow unedited, and telling the truth (at least to myself) about how I feel in the moment are a few other things I do to let the inner me know that she is safe and valued. Is there an obstacle or challenge that you’ve overcome that led to a deeper love for who you are? The meal planning challenge is a HUGE one, because it really opened my eyes to the ways I leap to prioritize others before myself. From start to finish, meal-planning three meals for five days straight takes me about 3 hours – hours I balked at setting aside for myself, but wouldn’t blink an eye to devote to someone else if asked. The first time I realized this it was HUGE for me; it was my opportunity to take a different approach towards myself in the future. If I can show myself even HALF of the love I show others on a consistent basis, I know, overall, my life can only get better and better. I’ve learned that self-love is not habitual for many (if not most of us) and is something that must be learned. Even the idea of practicing acts of self-love takes work, just to sit and figure out what it should LOOK like some days, before you can even get into the work of it. That said, the joy of getting and staying in love with you FAR outweighs the effort. The beauty and peace of mind that have come from this journey are immeasurable, quite honestly. I’m grateful that the older I get, the clearer I get about how best to support myself, and that feels lovely. Love Yourself First! Friday invites women to tell their LYFF stories to inspire and empower others to also fiercely demonstrate self-love in action. The questions are meant to shed light on various ways our featured Phoenixes are making self-care and intentional living a priority. Categories: Love Yourself First! Friday | Tags: healthy well-being, love yourself, Love Yourself First! Friday, meal planning, self worth, self-care, self-love, the phoenix rising collective, women's empowerment | Permalink.